our peaceful, family-owned, and fully operational horse farm nestled on 80 beautiful acres in the charming township of Lake Hamilton, Florida. Owned and operated by three generations of the Martin family, JRM Gypsies Thundering Ranch is dedicated to the expert care and breeding of our fine Gypsy and Mustang horses. Our love for horses goes back to when Jacky lived in Wyoming when she was a young girl and her mom bought her and her brother and sister a mustang to share. Which instilled in her a love for the mustangs and a respect for how intelligent and beautiful they are. When Randy and Jacky purchased their farm they were intrigued with the plight of the mustangs and with Jacky’s love of the breed they adopted several mustangs and burros from the Bureau of Land Management. Each mustang mare comes from a different state and each has her own personality. Randy always loved the Clydesdale horses with there feathered feet and large built bodies. When Randy and Jacky saw there first Gypsy horse at a horse expo in Jacksonville it was love at first sight, a horse that had the build and feathers, but was shorter, and so began the journey to acquiring our beautiful Gypsy herd. We purchased our first two gypsy mares from California. We had always planned on breeding to the one and only Lion King, but when we saw his son, then three week old “Charmer Prince of The Lion King” we fell in love and purchased him on the spot. He has proven to be the best stallion a person could own. He has all the great gypsy qualities and he passes them on, whether he breeds a gypsy or mustang mare. We have been asked why we breed our gypsy stallion to our mustang mares and we always answer everyone deserves the horse of their dreams and our stallion throws babies that become wonderful partners to whoever purchases them. Everyone that has purchased on of our gypstangs (gypsy/mustang cross) foals are completely mesmerized by them. We have people coming back to purchase more of our foals because they love them so much. Whether you want a full gypsy or a gypstang you can’t go wrong with one of our babies. 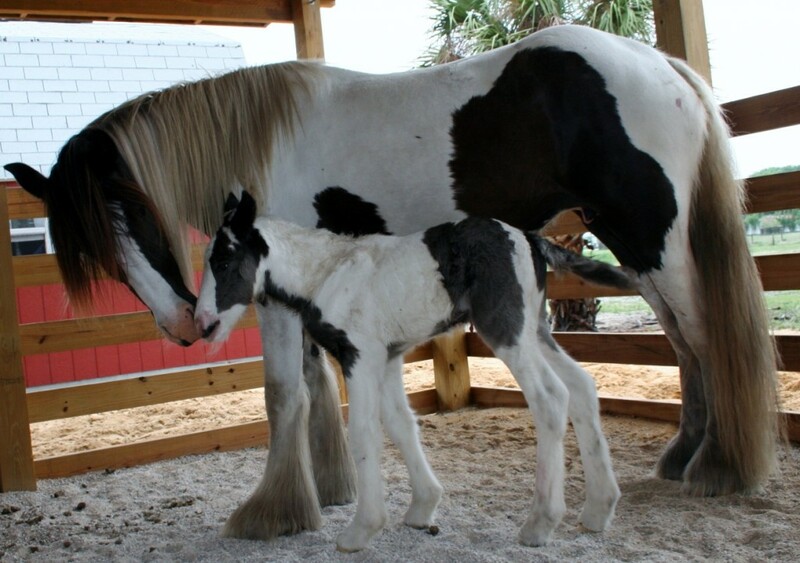 The ranch provides a perfect setting for our beautiful and unique Gypsy horses. In addition to a full-breeding facility, we also have two large riding arenas a covered 7500 square foot arena and a 20,000 square foot grassed arena, and a 50′ round pen. Our barn is complete with 8 12′ X 12′ horse stalls and 4 12′ X 16′ mare and baby stalls. It also has a veterinarian area with concrete floor and large walk through gates. We also have a 16′ X 20′ two horse fully equipped wash room complete with floor drain, and a small barn for our feed and tack room barn complete the horse care area.